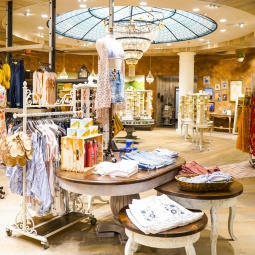 Riley Rose is sister store to Forever 21, which is also located inside the mall. However, Riley Rose focuses on all things beauty and beyond. 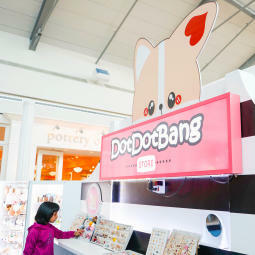 Offering fun and bright household items, small accessories and stationary, this store caters to Millennials and Generation Z. You can expect to find unique designs at every turn. 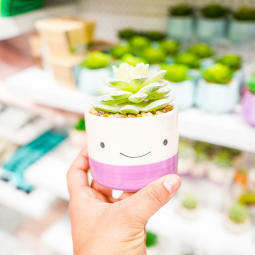 Some of my favorite pieces are the pineapple shaped cups, watermelon bath rugs and smiley succulents. Riley Rose sells some of the best makeup products in the industry and they keep it fun by constantly changing their inventory. They want customers to come in excited and ready to discover something new and exclusive. 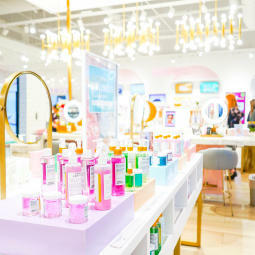 This is no ordinary beauty store. Have you heard of “squishy” toys? If you’ve been around children or tweens you probably have seen this toy live in action. Basically, it’s a toy made of foam that you squeeze and when you release it from your hand, it will slowly form back into its original shape. They are extremely popular and they come in all shapes, sizes, colors and some even come scented. DotDotBang is taking full advantage of this toy sensation and is offering one of the biggest selections of squishy toys in all of Texas. 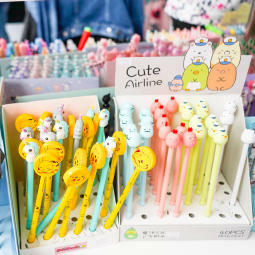 In addition to the famous squishy toys, they also carry Japanese inspired stationary and accessories. Some characters you can expect to see is the famous Pikachu and Gudetama. Okay, so Altar’d State can be found at other malls in the metroplex, but I wanted to share it because it has recently undergone an extensive renovation. Not only has it doubled in size, but its new architecture is whimsical. Large planters drape down from the ceiling and a stunning chandelier is found at the center of it all. 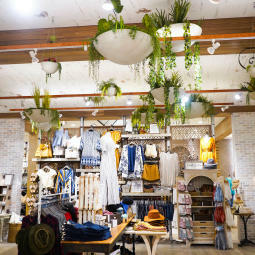 Altar’d State offers high quality fashion for women in all stages and is a place to find cute household décor and accessories. They even offer a nice seating area for those who may be waiting on their shopping companion. This store will leave you wanting to return. 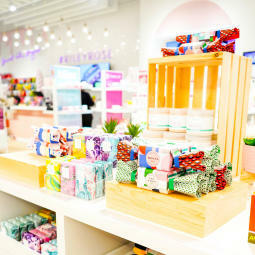 When you step inside of Lolli and Pop it’s like you’ve stepped into candy heaven. 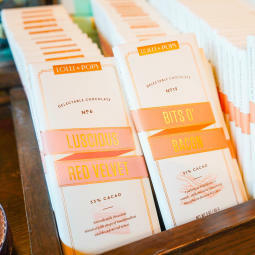 Delicious sweets fill every aisle and wall throughout the store. One neat thing about Lolli and Pop is that the store is set up into different themed candy rooms/sections. 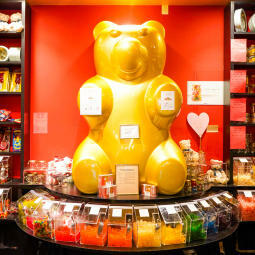 For example, if you are in the mood for gummy bears you can visit the gummy bear room and stock up on your favorite flavors. While there, don’t forget to rub the giant gummy tummy for good luck. If you prefer chocolate that day, head to the chocolate room. 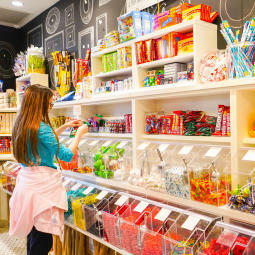 Their selection of candy brands is massive, but Lolli and Pop also sell their own candy line. With flavors like chocolate and bacon, it’s no wonder people love Lolli and Pop. Destination t-shirts are a popular souvenir, but most of the time they are not very fashion forward. 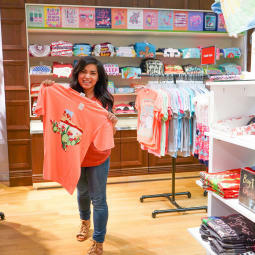 Sweet Tees store changes that negative stereotype and offers some of the most stylish t-shirts I’ve ever seen. 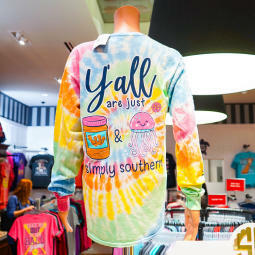 Some of the fashion lines they carry include, Southern Couture, Simply Southern and Country Chick. If you are in need of a cool t-shirt head to Sweet Tees. 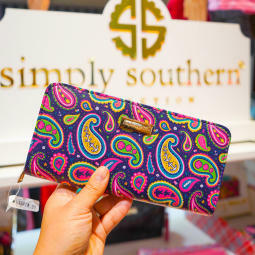 In addition to clothing, they also carry colorful wallets and bags. The southern vibe is sure to win you over. 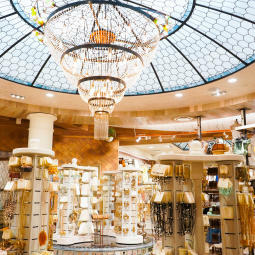 So, the next time you’re in Frisco, make sure to stop by Stonebriar Centre and experience some of the unique shopping it has to offer.